Jenny Learner (c., top) and Erika Vazzana (c., bottom) are just two of the 14 Bridgeport-area artists who've contributed to the Horses of Honor public art project. BRIDGEPORT — The Horses of Honor project features unique contributions from artists in all corners of the state, but the Bridgeport area lays claim to the most. Abbey Salch, a project spokeswoman, said the pitch to use South Side artists came from friend and art broker Amy King, who recommended Sally Ko, an artist working from Bridgeport's Zhou B Art Center. Another Zhou B artist, Injung Oh, soon followed. Accompanied by DJ music, Oh live-painted one of the horses at a recent "Third Friday" gallery event and invited the crowd to help out. "Then it spread like wildfire," Salch said. "Everybody said 'I want a horse. This is great.'" At least 14 local artists who work in and around the neighborhood have been selected to design and paint 90-some fiberglass horses that are getting installed at Downtown locations, including the Magnificent Mile, Merchandise Mart, prominent hotels, public parks and plazas. The horses are named after officers who've died in the line of duty. Their sale at an upcoming auction will benefit the Chicago Police Memorial Foundation, which sends money to the families of fallen officers, supplies college funds for their children and helps pay for rehabilitation and other necessary care for officers who survive injuries. 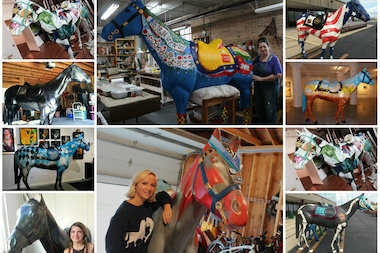 Erika Vazzana, of Canaryville, has completed two horses and is putting the finishing touches on a third, painted with a black, red and gray motif that serves a dual purpose: It mimics the colors of the project sponsor, the Sun-Times, and honors the widow of police officer Thor Soderberg, who told Vazzana that she wore red — not black — to her husband's funeral after he was shot and killed with his own gun in 2010. To finish it off, Vazzana has invited Soderberg's family and closest friends to stamp the horse with their fingerprints, a clever nod to both ink-stained newspaper readers and police work. "They'll be putting their mark, emotionally and aesthetically, on their fallen friend," she said. Jenny Learner works from the Zhou B Art Center, 1029 W. 35th St.
She's completed one horse honoring Eric Lee, who was shot and killed in Englewood in 2001. Learner said she remembered hearing about the case on the news back then and it shook her up. "I thought about him a lot while painting," she said. And Learner is about to finish another, which honors Helen Cardwell, a police officer killed in 1988 after a car wreck. Learner said Cardwell was one of a handful of women who've been killed on duty. Learner's contributions are just two to come from Zhou B Art Center. Nine other artists working at the South Side studios and gallery have contributed to the project. They include Alexander Villalobos, Maja Bosen, Oh, Robin Rios and The 4 Art Team, Diana Leviton Gondek, Rine Boyer, Yva Neal, Francisco Rada and Laurie Murphy. Horses of Honor also features contributions from Chinatown resident Rich Lo and Dawn Korman, who work from the Mana Contemporary art center at 2233 S. Throop St.